First of all, thank you so much to everybody who supported the Kickstarter campaign for the eighth Evil Inc book! We unlocked some awesome Stretch Goals — including free Tales from The Con comics, Guigar Laugh ringtones and a 416-page PDF of The Complete Greystone Inn. I’m finishing up illustrations for the book, doing last-minute edits and compiling the List of Supporters. Then it’s off to the printer! So thank you for your support — whether it was a pledge or simply spreading the word on social media! Also, I want to thank everyone who came out to see me at Philadelphia Comic Con. It was a tremendous four-day show, and it was great to be able to reconnect with many of my Philly-based readers. 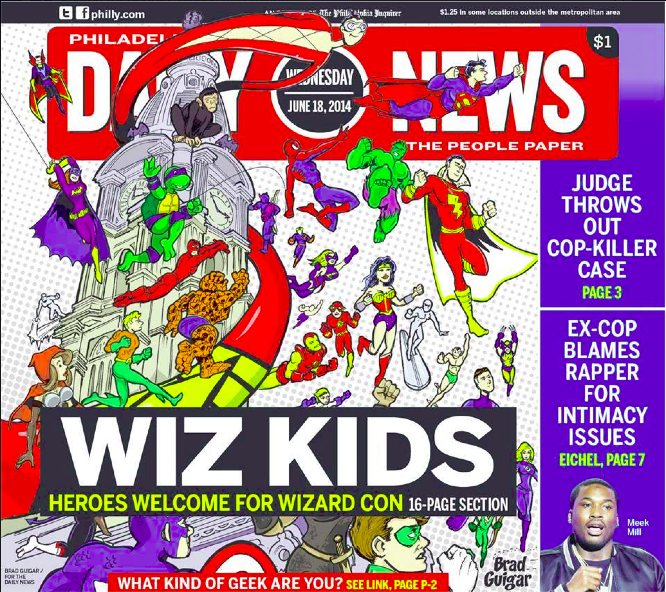 I have a few extras from that show — including signed copies of the issue of the Philadelphia Daily News which features my illustration on both the front cover and the cover of the special section promoting the event. I’ll put those up on my store later this week if you’d like a copy for yourself. I also want to thank everyone who came out to one of my three panel discussions. We had a raucous panel to kick-off the series, with some really fine webcartoonists representing the field — Christian Patchell, Jason Thomas, Dawn Griffin and Chris Flick. They displayed a wide breadth of approaches to independent publishing on the Web, and I know everyone who showed up to that panel left a little wiser and a lot inspired. Hopefully the same can be said of the people who attended my other two solo panels — Webcomics Start-Up and Patreon Primer. I want to include a special thank-you to Wizard World’s Director of Programming Christopher Jansen, who has supported my doing these panels for a long time. If you’ve ever been to a Wizard convention, you know that their programming is world-class Awesome. If you’re like me, the programming is a major deciding factor in attending a convention. That being said, your attending a Wizard show was a direct result of the Herculean effort that Chris and his dedicated crew exert at — count ’em — 18 shows per year. That’s more than once a month. It’s mind-boggling. Finally, I want to thank the kind Evil Inc henchpeople who helped me out at my booth this year — Jonah, Jeffrey, Tara, Jeff, Dianna and Isabelle. During the show, if you were handed an iPad queued up with the Evil Inc monthly comic, that was the Littlest Henchman, and he was indispensable. When he wasn’t assisting sales, his persistent “Shouldn’t you be drawing more?” kept me on-task where my Commission List was concerned. It was a pleasure, as always, to talk to you again, Brad! Was The Littlest Henchman the one quizzing me about World of Warcraft and Doctor Who?